Do you remember my recent review of the fun Stick Puppet Party Kits by Tigercandy Arts, Inc.? Due to reader interest I am thrilled to be able to introduce you to Sockett® Sock Puppets. 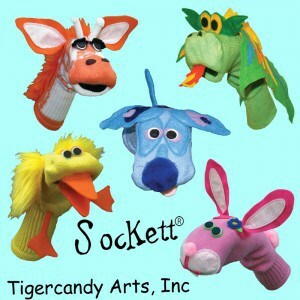 Tigercandy Arts, Inc. has created a high quality line of Sockett® Sock Puppets designed to inspire your child’s imagination. 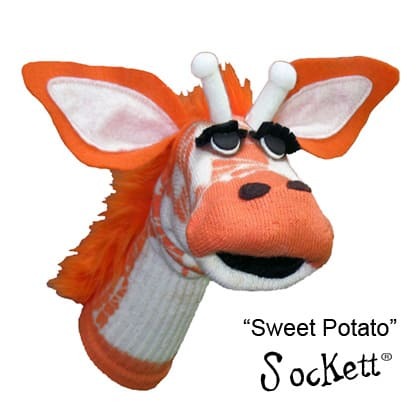 These whimsical and adorable Sockett® Sock Puppets made me want to hug it as these sock puppets are just so charming. Each Sockett® Sock Puppet is handmade with love by Tigercandy Arts, Inc. and is made from American cotton socks and 100% ecospun felt. I really appreciate the depth of “realism” of expression that these Sockett ® Sock Puppets have and it really does give them the ability to “speak” and show emotions. My children had so much fun playing with the Sweet Potato ™ Giraffe Sockett®. My five year old son had a beloved stuffed Giraffe named “Boss” when he was a baby and as soon as he laid eyes on Sweet Potato it was love at first sight. He put on the most creative and imaginative puppet shows for his siblings and they were just delighted and laughing at his completely original and funny songs and monologues. The exceptional quality of Tigercandy Arts, Inc. Sockett® sock puppets is apparent in the puppet that I received for this review. The creators of Tigercandy Arts, Inc. truly have a passion for puppet making and want to inspire the same love in children. Tigercandy Arts, Inc. utilizes their experience as artists, art educators and designers to allow your children the opportunity to express themselves through their puppet adventures. You can view the entire selection of Sockett® Sock Puppets and pick your favorites to give as fun and creative gifts for the holidays. My personal favorites are the adorable Fenton Frog™ ® Sock Puppet and the Triceratops Dinosaur Sockette®. Sockett® Sock Puppets can be purchased for only $35.00 and I am confident that they will provide hours of fun and imaginative play for any lucky child. **Exclusively for Simply Stacie Readers, Tigercandy Arts, Inc. is offering a 10% off discount for all Sockett® puppets. Use code “stacie2” upon checkout and offer is valid through December 15th. I must have Fenton™ Frog Sockett®…too cute! thanks. I like the Coco-Zen – Chocolate Lips-To-Go: Chocolate Chai Spice at your OSS. Entered the Pretty Neat Giveaway for $250 Cash…many times! Oh my gosh, those are TOO, too cute. I’m pretty sure I would pick the unicorn! I really love sweet potato giraffe. It is so cute and my grandson loves giraffes.